З моменту відкриття неонікотиноїди вважалися найбільш перспективними сполуками з інсектицидною активністю в силу специфічної дії на нікотинові ацетилхолінові рецептори саме комах і низьку токсичність для ссавців у використовуваних діапазонах концентрацій, а також у зв'язку з відсутністю формування стійкості до них у комах. Уведення неонікотиноїдів у сільськогосподарську практику дозволило істотно підвищити врожайність різних культур. Однак при активному повсюдному використанні даного класу інсектицидів було виявлено цілу низку негативних наслідків, зокрема для комах-запилювачів. Виявлення даних ефектів призвело до суттєвого обмеження або до заборони використання даних сполук у сільськогосподарській практиці ряду країн. Україна до переліку цих країн не входить. Виходячи з того, що препарати даного класу вільно продаються і безконтрольно використовуються, відповідні діючі речовини постійно присутні в агроценозах, та їх залишкові (не летальні) концентрації можуть впливати на життєдіяльність і репродукцію комах, причому як шкідників, так і корисних або нейтральних. Дане дослідження є експериментальним порівняльним аналізом впливу залишкових концентрацій інсектицидів неонікотиноїдного ряду і нікотинової кислоти на особливості розмноження дрозофіли. Результати експерименту показали, що нікотинова кислота чинить подібний за напрямком (пригнічення), але менш сильний (у порівнянні з використаними інсектицидами) вплив на плодючість і життєздатність генетично різних ліній дрозофіли. Виявлено генотип-залежні ефекти досліджених домішок на смертність на стадії лялечки. Встановлено також, що серед нащадків особин, які пережили вплив, частка таких, які доживають до личинкової стадії, збільшується у порівнянні з контрольною групою. Іншими словами, залежно від генотипу тривалий (в онтогенезі) вплив неонікотиноїдів і нікотинової кислоти в низьких концентраціях може зсувати добір у потомстві особин, які пережили вплив, з ранньої ембріональної стадії у бік батьківських особин (тобто впливати на гаметогенез і життєздатність гамет). Barbara G.S., Grunewald B., Paute S. et al. Study of nicotinic acetylcholine receptors on cultured antennal lobe neurones from adult honeybee brains // Invert. Neurosci. – 2008. – Vol.8, issue 1. – P. 19–29. Bass C., Denholm I., Williamson M.S., Nauen R. The global status of insect resistance to neonicotinoid insecticides // Pestic. Biochem. Physiol. – 2015. – Vol.121. – P. 78–87. Belzunces L.P., Tchamitchian S., Brunet J.L. Neural effects of insecticides in the honey bee // Apidologie. – 2012. – Vol.43. – P. 348–370. Bownes M. A photographic study of development in the living embryo of Drosophila melanogaster // J. Embryol. Еxp. Morph. – 1975. – Vol. 33, no. 3. – P. 789–801. Bromilow R.H., Chamberlain K., Evans A.A. Physicochemical aspects of phloem translocation of herbicides // Weed Science. – 1990. – Vol.38. – P. 305–314. Buckingham S.D., Lapied B., Corronc H.L. et al. Imidacloprid actions on insect neuronal acetylcholine receptors // J. Exp. Biol. – 1997. 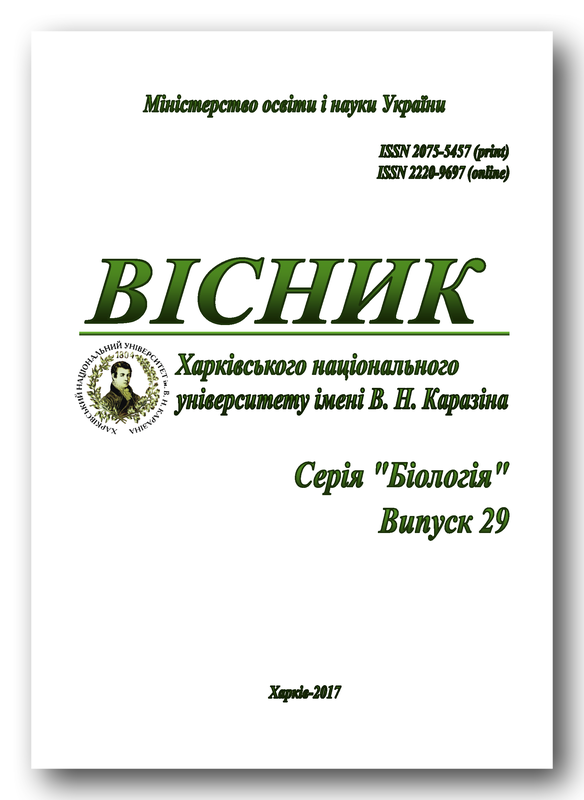 – Vol.200. – P. 2685–2692. Casida J.E. Neonicotinoid metabolism: compounds, substituent’s, pathways, enzymes, organisms, and relevance // J. of Agriculture and Food Chemistry. – 2010. – Vol.59. – P. 2923–2931. Chao S.L., Casida J.E. Interaction of imidacloprid metabolites and analogs with nicotinic acetylcholine receptor of mouse brain in relation to toxicity // Pestic. Biochem. Physiol. – 1997. – Vol.58. – P. 77–88. Di Prisco G.V., Cavaliere V., Annoscia D. et al. Neonicotinoid clothianidin adversely affects insect immunity and promotes replication of a viral pathogen in honey bees // Proc. Nat. Acad. Sci. USA. – 2013. – Vol.110. – P. 18466–18471. Henry M., Beguin M., Requier F. et al. A common pesticide decreases foraging success and survival in honey bees // Science. – 2012. – Vol.336. – P. 348–350. Jones A.K., Brown L.A., Sattelle D.B. Insect nicotinic acetylcholine receptor gene families: from genetic model organism to vector, pest and beneficial species // Invertebrate Neuroscience. – 2007. – Vol.7, issue 1. – P. 67–73. Jones A.K., Raymond-Delpech V., Thany S.H. et al. The nicotinic acetylcholine receptor gene family of the honey bee, Apis mellifera // Genome Research. – 2006. – Vol.16, issue 11. – P. 1422–1430. Kostenko V.V., Kolot N.V., Vorobyova L.I. Research of embryonic mortality stages of Drosophila melanogaster depending on age and starvation of an imago // Russian Journal of Developmental Biology. – 2015. – Vol.46, issue 6. – P. 381–388. Lansdell S.J., Millar N.S. Cloning and heterologous expression of D-alpha-4, a Drosophila neuronal nicotinic acetylcholine receptor subunit: identification of an alternative exon influencing the efficiency of subunit assembly // Neuropharmacology. – 2000. – Vol.39. – P. 2604–2614. Liu G.Y., Ju X.L., Cheng J. Selectivity of imidacloprid for fruit fly versus rat nicotinic acetylcholine receptors by molecular modelling // J. Mol. Model. – 2010. – Vol. 16. – P. 993–1002. Matsuda K., Shimomura M., Ihara M. et al. Neonicotinoids show selective and diverse actions on their nicotinic receptor targets: Electrophysiology, molecular biology, and receptor modeling studies // Biosci. Biotechnol. Biochem. – 2005. – Vol.69. – P. 1442–1452. Moffat C., Buckland S.T., Samson A.J. et al. Neonicotinoids target distinct nicotinic acetylcholine receptors and neurons, leading to differential risks to bumblebees // Scientific Reports. – 2016. – Vol.6. – P. 1–10. Palmer M.J., Moffat C., Saranzewa N. et al. Cholinergic pesticides cause mushroom body neuronal inactivation in honeybees // Nature Communications. – 2013. – Vol.4. – P. 1634–1642. Sattelle D.B. Invertebrate nicotinic acetylcholine receptors-targets for chemicals and drugs important in agriculture, veterinary medicine and human health // J. of Pestic. Sci. – 2009. – Vol.34, issue 4. – P. 233–240. Sattelle D.B. Acetylcholine receptors of insects // Adv. Insect. Physiol. – 1980. – Vol.15. – P. 115–215. Sattelle D.B., Breer H. Cholinergic nerve terminals in the central nervous system of insects: molecular aspects of structure, function and regulation // J. Neuroendocrinol. – 1990. – Vol.2. – P. 241–256. Sheets L.P. The neonicotinoid insecticides // Neurotoxicology handbook. Vol.1. / Ed. E.J.Massaro. – Oxford, UK: Humana PressInc., 2002. – P. 79–87. Shi T.-F., Wang Y.-F., Qi L.L. et al. Sublethal effects of the neonicotinoid insecticide thiamethoxam on the transcriptome of the honey bees (Hymenoptera: Apidae) // Journal of Economic Entomology. – 2017. – Vol.110, issue 6. – P. 2283–2289. Thany S.H. Neonicotinoid insecticides: historical evolution and resistance mechanisms // Adv. Exp. Med. Biol. – 2010. – Vol.683. – P. 75–83. The vitamins: fundamental aspects in nutrition and health / Ed. G.F.Combs. 3rd ed. – 2007. – P. 54–55. Tomizawa M., Casida J.E. Neonicotinoid insecticide toxicology: mechanisms of selective action // Annu. Rev. Pharmacol. Toxicol. – 2005. – Vol.45. – P. 247–268. Tomizawa M., Casida J.E. Molecular recognition of neonicotinoid insecticides: the determinants of life or death // Acc. Chem. Res. – 2009. – Vol.42. – P. 260–269. Tomizawa M., Yamamoto I. Binding of nicotinoids and the related compounds to the insect nicotinic acetylcholine receptor // J. Pestic. Sci. – 1992. – Vol.17. – P. 231–236. Tonnang H.E.Z., Herve B.D.B., Biber-Freudenberger L. et al. Advances in crop insect modelling methods – Towards a whole system approach // Ecological Modelling. – 2017. – Vol.354. – P. 88–103. Yamamoto I., Casida J.E. Nicotinoid insecticides and the nicotinic acetylcholine receptor. – Springer-Verlag, Tokyo, 1999. – P. 3–27.